Bring a cool industrial look to your hallway, entryway, or living room with this sofa table. The table's iron base with rivets and cable stretchers exudes vintage industrial style, while the planked solid pine top brings a warm and rustic feel to the console table. The Ashford Industrial Sofa Table with Cable Stretchers by Steve Silver at Walker's Furniture in the Spokane, Kennewick, Tri-Cities, Wenatchee, Coeur D’Alene, Yakima, Walla Walla, Umatilla, Moses Lake area. Product availability may vary. Contact us for the most current availability on this product. Showcase rustic industrial style with the Ashford table group. Solid pine table tops with a planked effect give each table a sense of rustic warmth, enhanced by the beautiful Antiqued Honey finish. 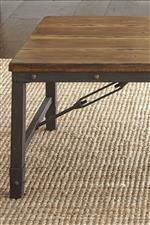 Metal bases add industrial appeal, with cable stretchers providing an authentic accent. Add a touch of urban industrial style with just one table, or capture the whole look with this entire accent table collection. The Ashford collection is a great option if you are looking for Rustic Industrial furniture in the Spokane, Kennewick, Tri-Cities, Wenatchee, Coeur D’Alene, Yakima, Walla Walla, Umatilla, Moses Lake area. Browse other items in the Ashford collection from Walker's Furniture in the Spokane, Kennewick, Tri-Cities, Wenatchee, Coeur D’Alene, Yakima, Walla Walla, Umatilla, Moses Lake area.